Possibly the best part of the Christmas season is all of the buildup to Christmas. It's like having a month of holidays. What did we do with all of that excitement? We did a little puddle stomping. . .
. . . some bike riding. 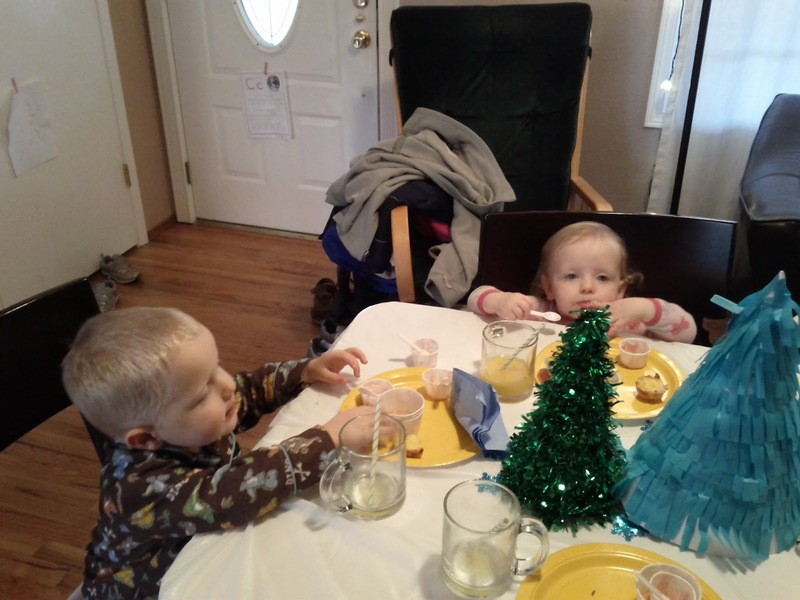 . .
Jared and Eloise were invited to a Christmas pajama party and brunch. All of the other children ate and went to play. Jared and Eloise tucked in like it was their last meal on earth. They ate and ate and ate and ate. 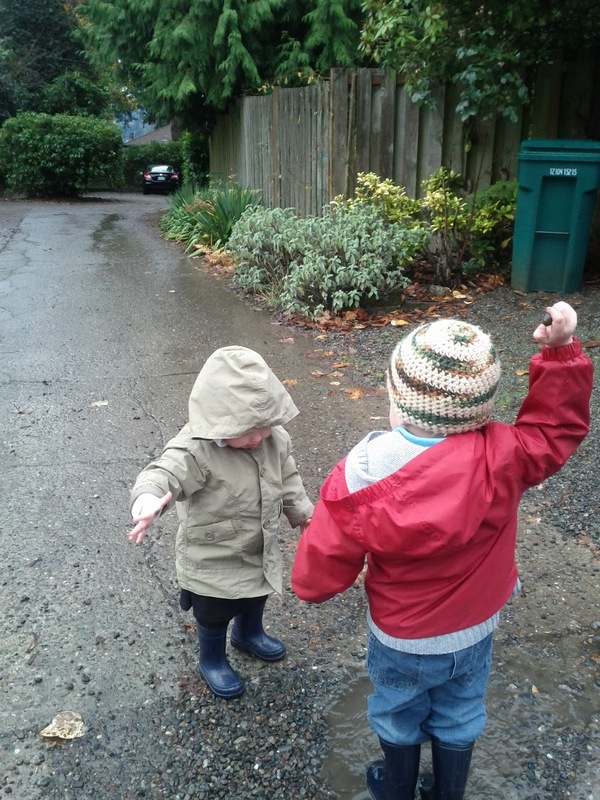 Eventually they went to play, long after the other children. One of the party games was writing letters to Santa. Jared asked Santa for a paper towel holder. Guess what Jared got his mom for Christmas. Grandma Jill came on December 5, and stayed until December 28. 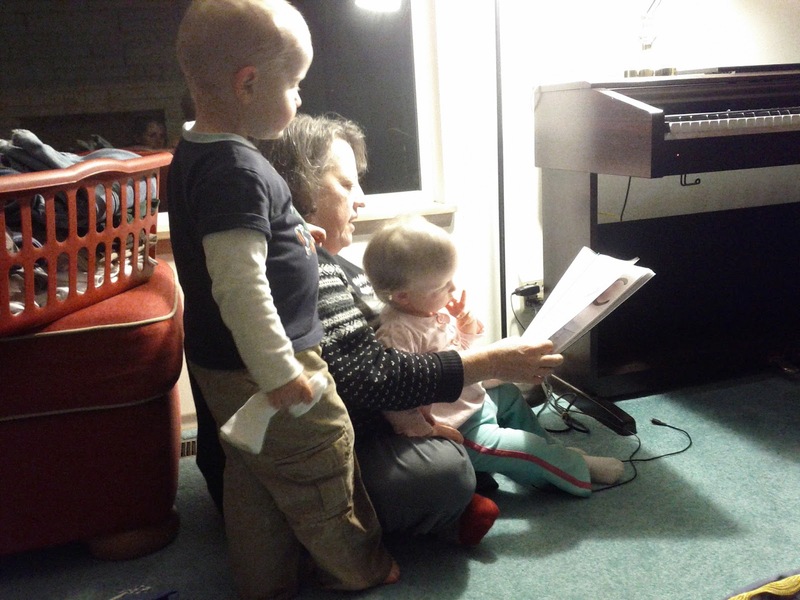 Jared and Eloise got a lot of stories out of her. Or bouncing up and down with excitement. 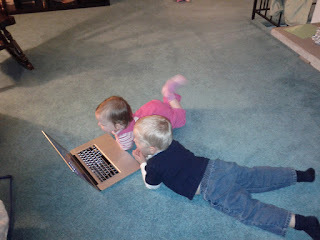 Jared and Eloise love watching Elmo's World and clicking through the alphabet on starfall.com. One thing that Jared really wanted to do this Christmas season was go to the Bellevue Square Mall. 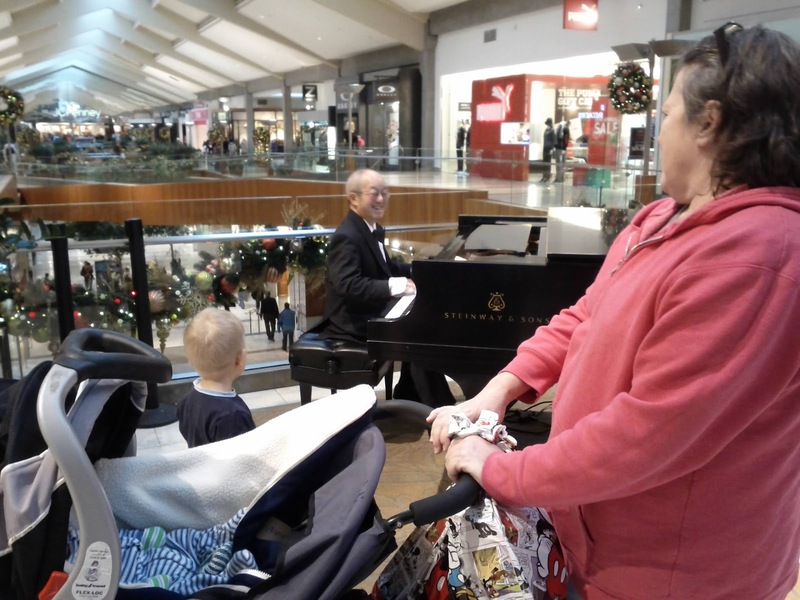 He absolutely did not want to see Santa. 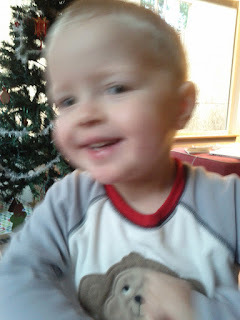 What he really wanted to see was the reindeer bobbing near the ceiling, and all of the Christmas trees. As an added bonus, we came across some live music. 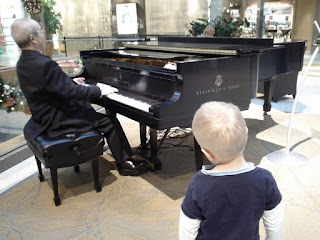 The most memorable moment of our visit to the mall came as we got in the elevator to leave the play area. Who should follow us into the elevator but Santa himself! Jared edged through the throng of people in the elevator until he was standing directly in front of Santa, eyes wide, and speechless. Santa asked for a high five, which Jared gave him, still dumbstruck to be in the elevator with SANTA! Sometime during the month we devoted a week to Eloise and her drug allergy, and then Jared got a cough, and then Todd got a cough. 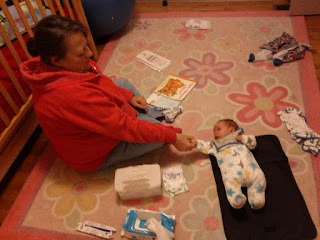 Benjamin doesn't seem to mind the decreased attention on him. Here he is chilling in some tummy time. All of a sudden the month had slipped away, and Christmas Eve was upon us. 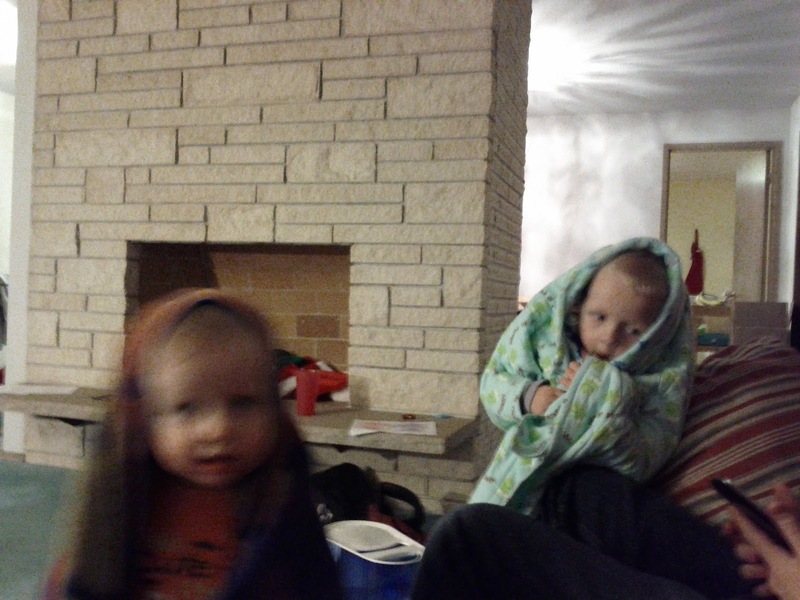 Jared and Eloise were excited to don towels and blankets to reenact the Christmas story in thirty second segments, until something else caught their attention. 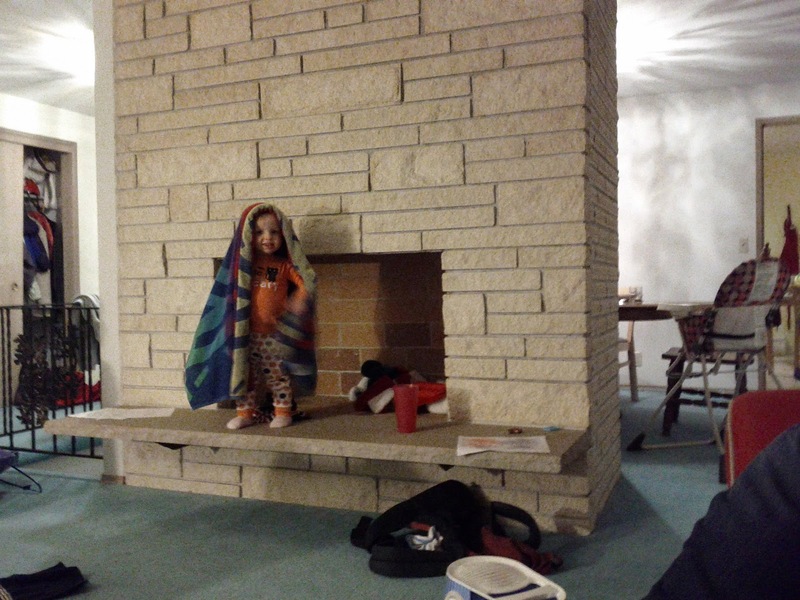 Eloise really enjoyed her "towel hat." Before we knew it it was time to set out stockings for Santa, and try to get Jared to stay in bed long enough to fall asleep so that Santa could come. More Christmas adventures are coming soon. 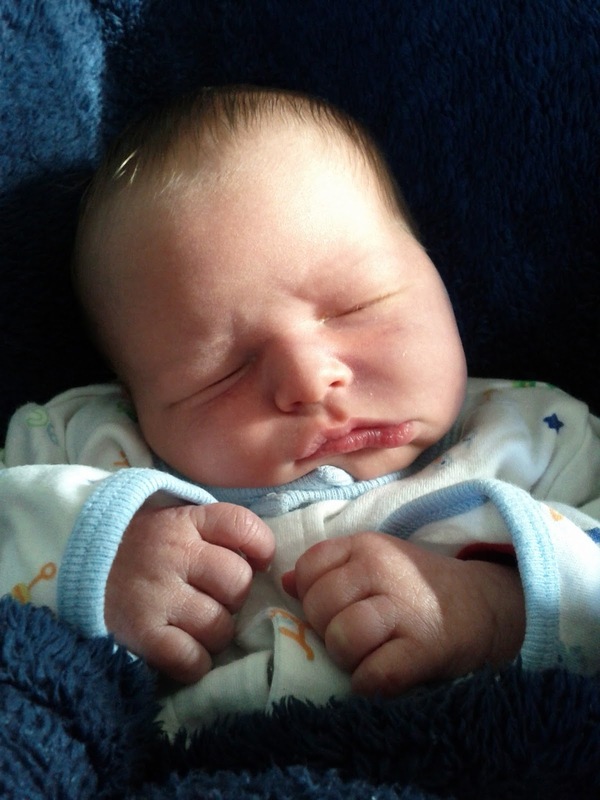 Benjamin is very sweet and cuddly, but, let's face it, newborn babies don't do a whole lot. 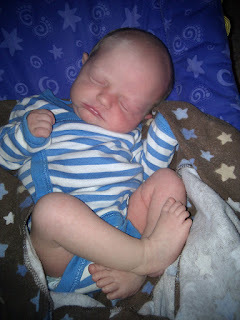 As he sleeps and sleeps and sleeps, a little baby comparison is inevitable. People ask me all the time who he looks like. You decide. Who does he look like? I think all three of them came from the same mold. One month ago today, a new chapter commenced in the Knight's story. Chapter one started on June 6, 2006: "Todd and Savannah get married and go to college." Chapter two, entitled "Todd and Savannah try Parenthood" began three years later, on August 21, 2009. Chapter three, "Eloise," started on April 16, 2011. Each of these new beginnings has felt like a page has turned, and a new story has begun. In almost no time, we begin to measure time by distance from the most recent beginning, and all events previous become hazy in our memories. Chapter four, "Knights; family of five," has been no different. 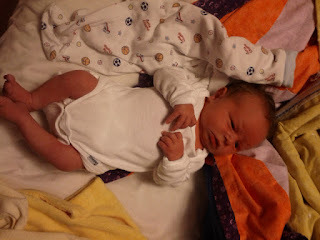 The time has passed oh-so-quickly, but it is hard to picture our family before sweet, sleepy little Benjamin arrived. 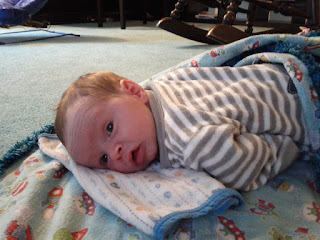 In his short time, Benjamin's hair has gotten longer and more unruly, if you can believe it. 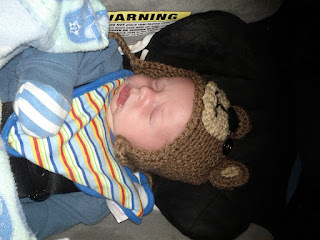 Here he is dressed for his first trip to church on December 2. 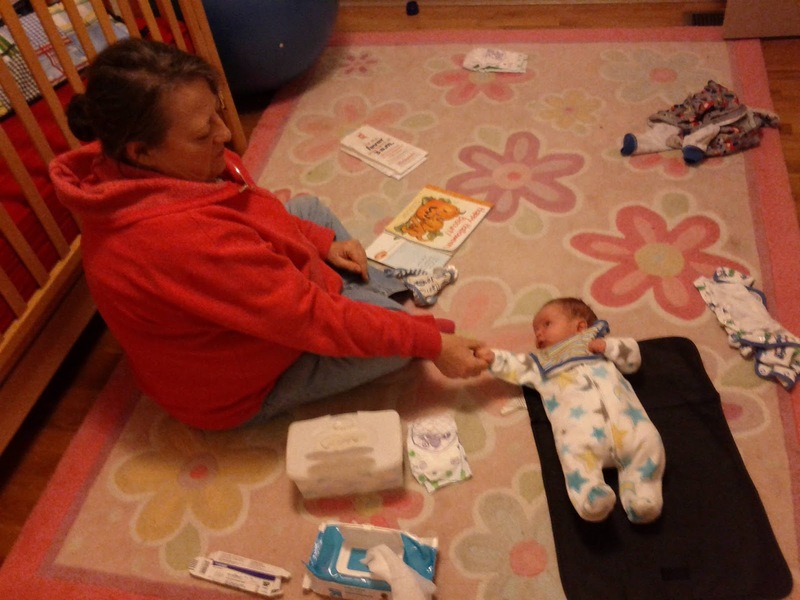 Grandma Jill has been here since December 5. We would be lost without her. Ben is more wakeful during the day. . . sometimes. 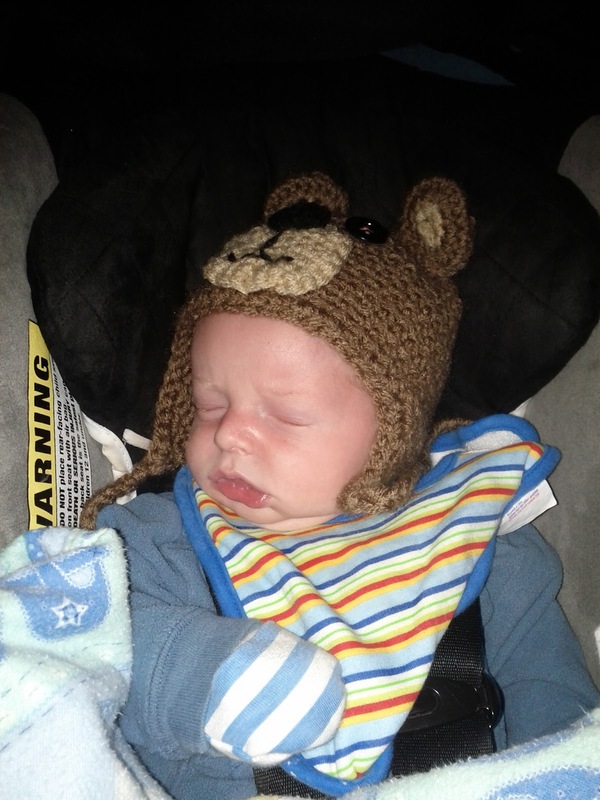 Here he is sporting his matching bear hat to be the third bear with Jared and Eloise's Halloween costume. 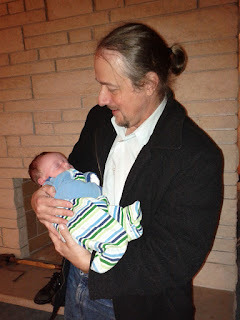 Last Saturday, December 15, he met his Grandpa Michael, who came to visit for an afternoon. Jared insisted that Grandpa Michael wear this hat for pictures. Eloise loves her baby brother. She likes to tell me what his cries mean. "Benyamin ky-ing. Hun-ghee." "Benyamin ky-ing. Want Mommy." Here she rocks him as we wait for Grandma to mail packages at the post office. 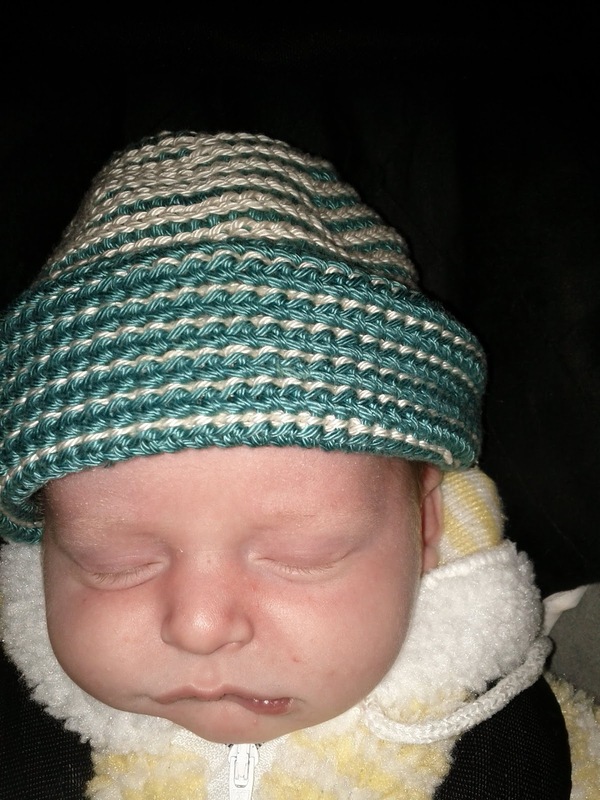 One of Todd's coworkers knitted this sweet hat for Ben. I think it looks like it jumped out of a Dr. Seuss book. 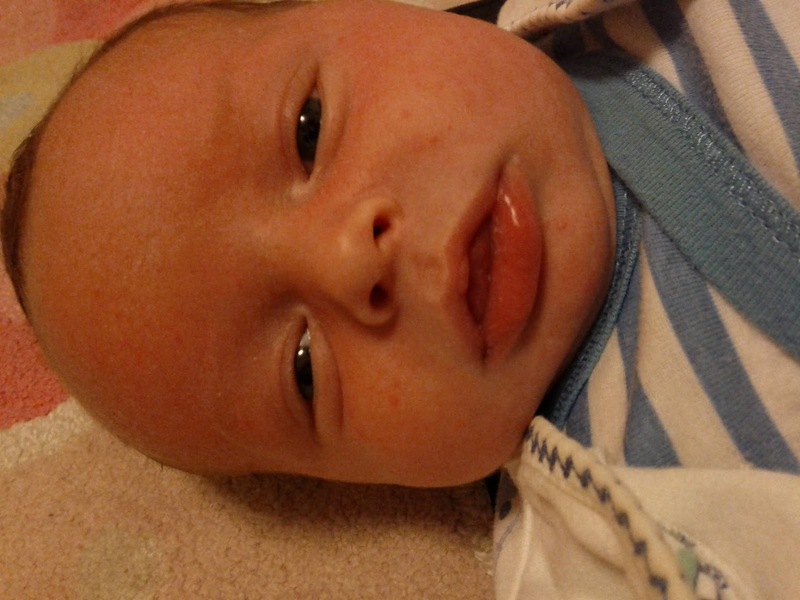 Can you see how much he is changing? 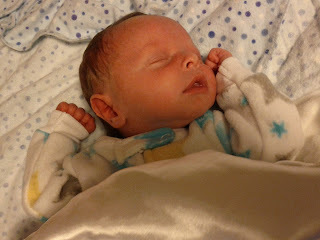 I am so thankful for this new, peaceful little soul in our family. As Christmas approaches, Eloise is having a little bit of trouble differentiating between Baby Benjamin, who is tangible and present for her, and the stories of Baby Jesus. 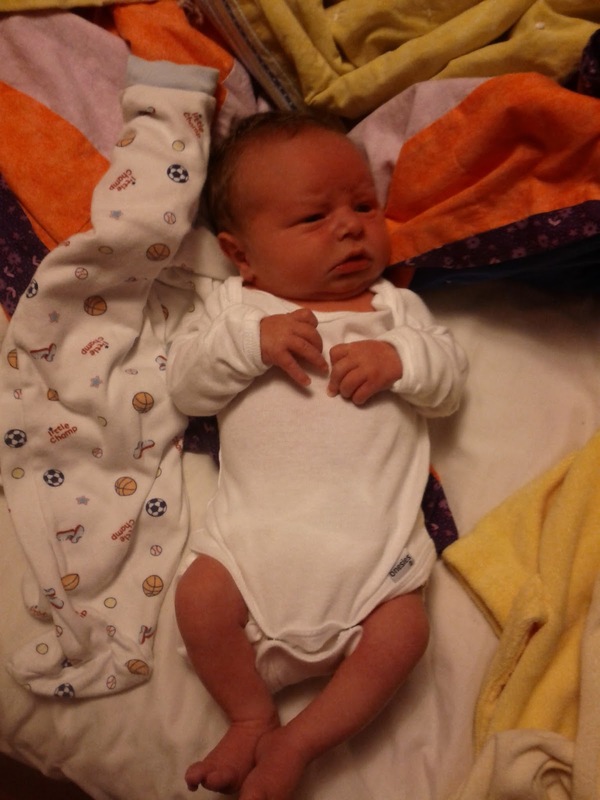 Happy one month day, Benjamin! It is a great joy to see you grow. 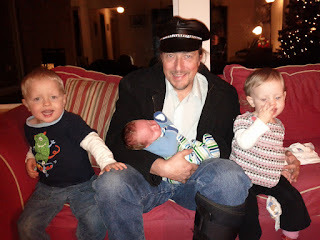 When I pictured our family's adjustment to having a third baby in the house, I pictured some sleepless nights, maybe Jared and Eloise having some tantrums, potty accidents, or wakeful nights. We have had a bit of all of that. 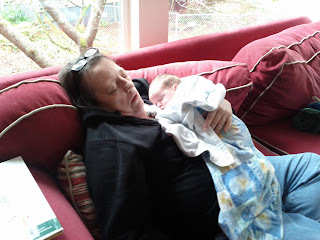 What I didn't picture was spending ten hours in and out of doctor's offices with a very sick, sad little Eloise. 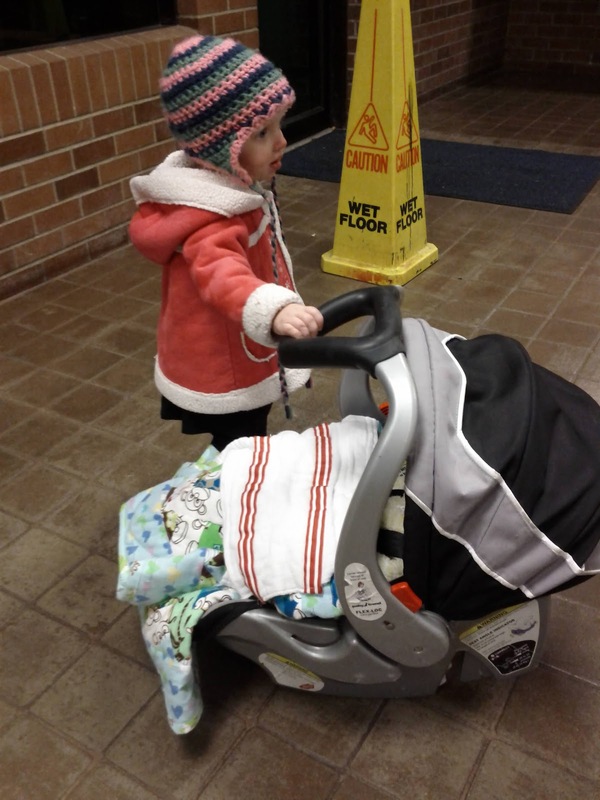 A week ago last Monday, on December 3, I took Eloise to the doctor's office to get her checked out for a persistent cough that my mama in law suggested might be an ear infection. Sure enough, the princess had an ear infection and a sinus infection. We got a prescription for antibiotics and assumed that our troubles with winter illness were behind us. On Monday, December 10, Eloise got really crabby in the afternoon. 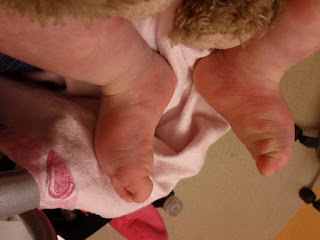 When I changed her diaper, I noticed a few small spots on her legs. 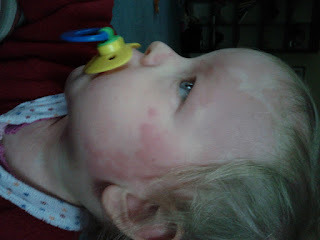 I thought she might be having a mild drug reaction, but I gave her her evening dose anyway, since it was only a few spots. 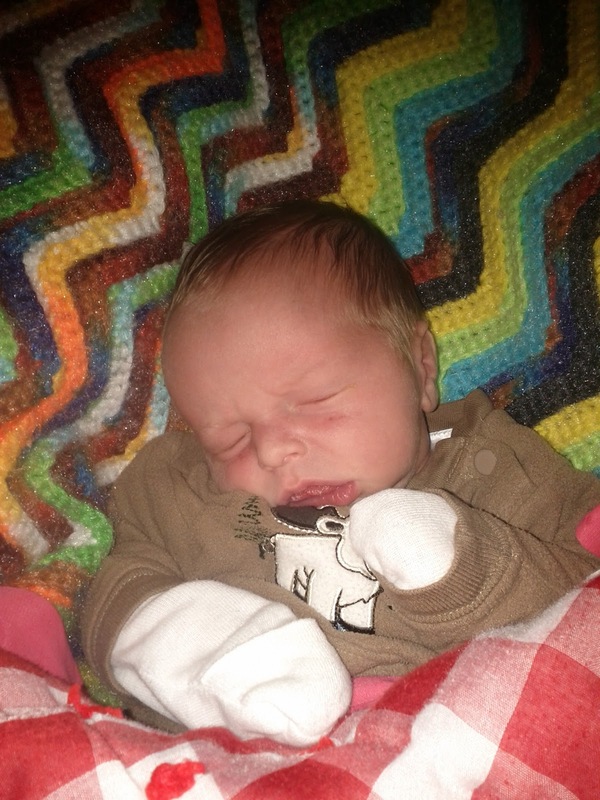 I called the doctor's office first thing Tuesday morning, before Eloise was awake, to get her seen that afternoon. 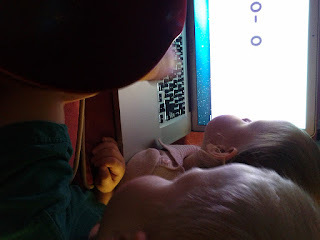 When I spoke to the nurse, she said to stop giving Eloise her antibiotics, and, if she developed any swelling on her face to bring her in right away, with an appointment or without. 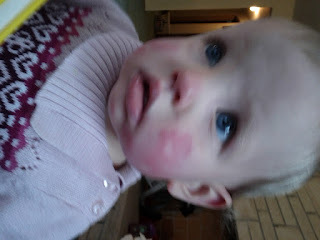 Shortly after I spoke to the nurse, Eloise woke up covered head to toe in massive, swollen, itchy hives. Her face and neck had puffed up under the hives. 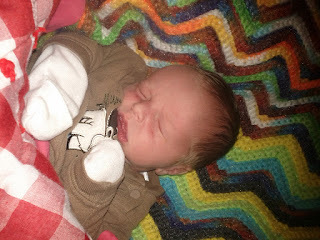 Benjamin was supposed to be circumcised late Tuesday morning, but I called that doctor to cancel our appointment so that I could take Eloise in to be seen right away. 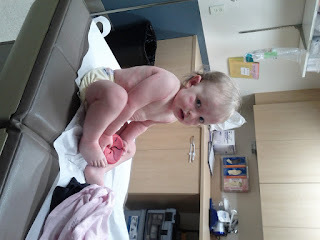 Eloise was a trooper in the doctor's office. 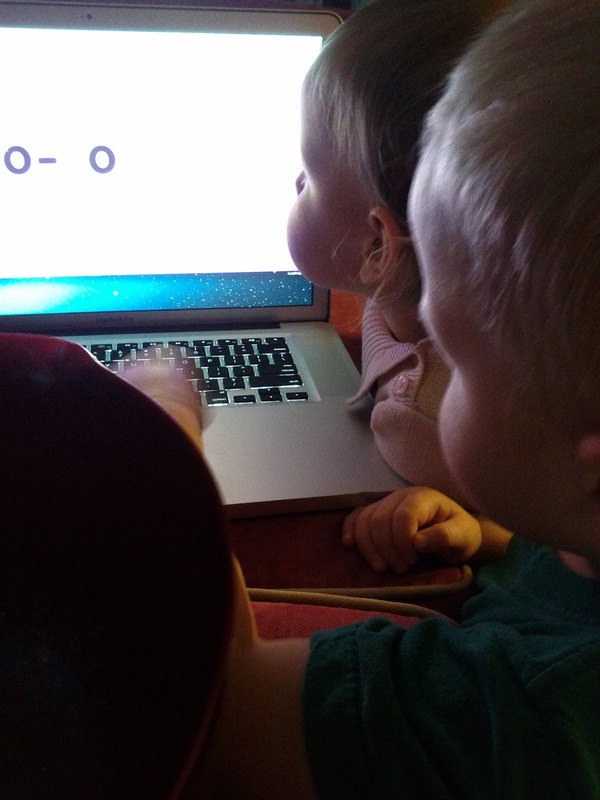 We couldn't see our regular doctor, Dr. Belarmino, on such short notice, but Eloise kept asking for "Dottor Mino." When he heard she was there, he came in to see her in between appointments. Eloise got a dose of benadryl, a new antibiotic to clear up what was left of her sinus infection, and another antihistamine, zyrtec. The doctor told us it could take up to a week for the hives to go away. Sure enough, the hives looked worse on Wednesday. Eloise spent all day scratching her head and doing a little body wiggle so that her shirt would scratch her back for her. During the course of the morning, I noticed that she was shivering uncontrollably with a low fever. I called the nurse again, and she assured me that the fever was most likely her body still fighting the sinus infection. On Thursday, the hives started to go away, but the fever remained. Eloise seemed happy, but when Todd came home from work, he noticed that her walk had changed, and when we started to get her ready for bed, we discovered why. 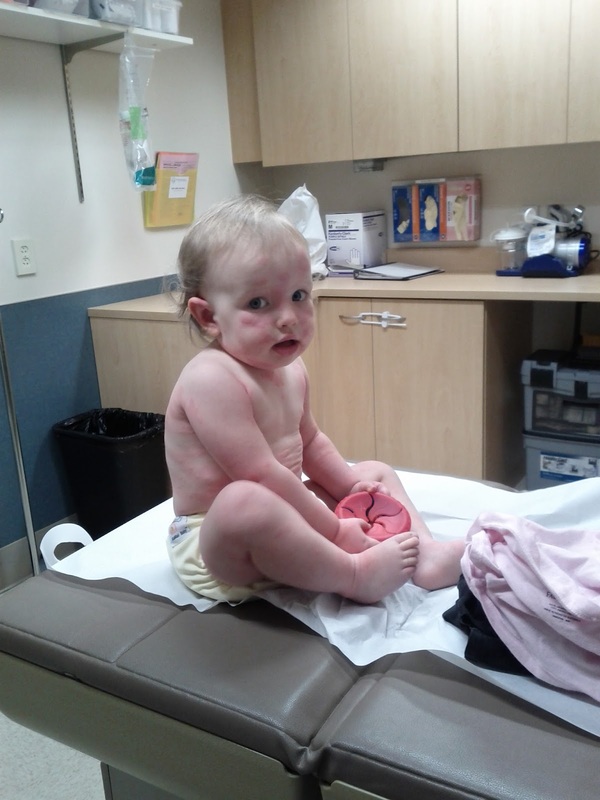 Her legs and arms were swelling up like balloons. 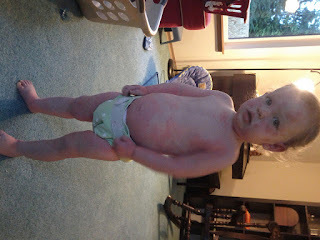 I called the advice nurse again, hoping against hope that she would tell me that swelling limbs is a common side effect of hives, and that there was nothing to worry about. Instead, she said she needed to consult with the on call doctor, and would call me back. 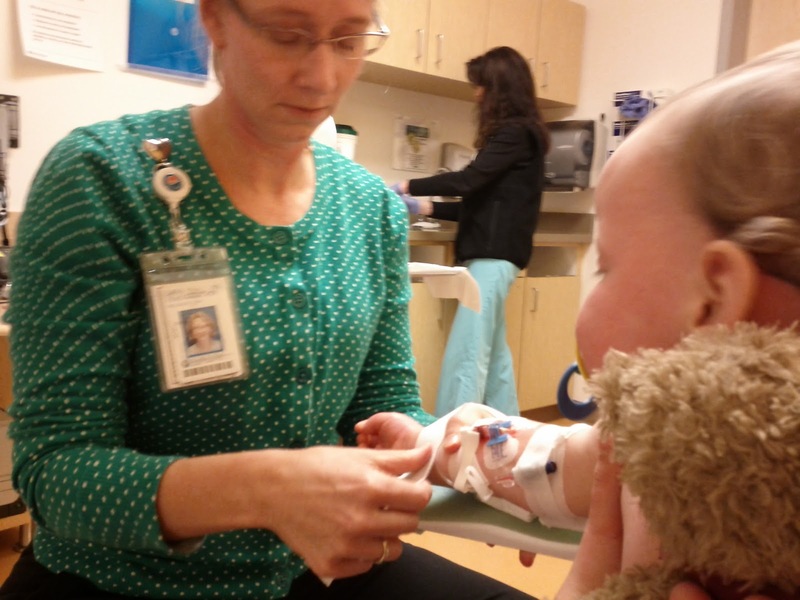 The doctor wanted her to be seen right away, so we drove to pediatric urgent care in Bellevue at 8:30 p.m.
Fortunately, there was no wait to see a doctor. Eloise was tired, but in a fairly good mood. She told me, "Feet hurt!" 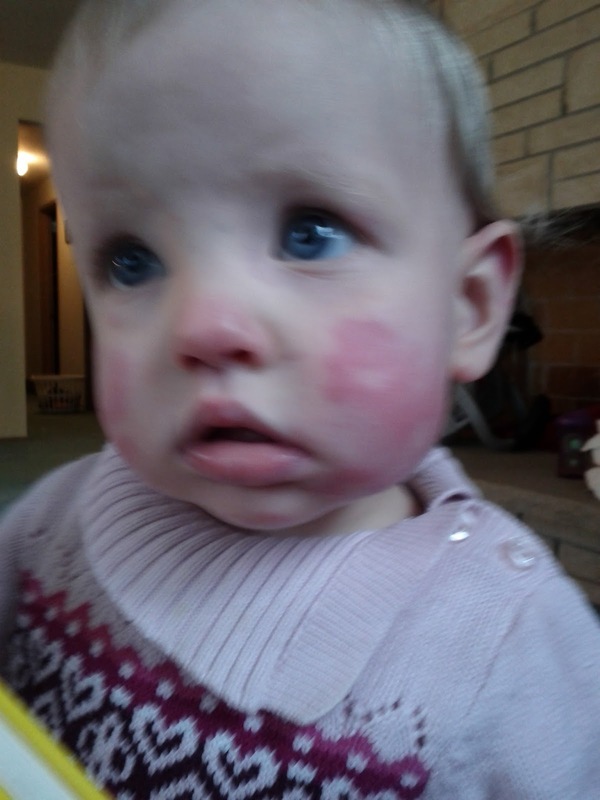 The doctor evaluated her and determined that, instead of a simple allergic response to penicillin, Eloise had developed serum sickness. 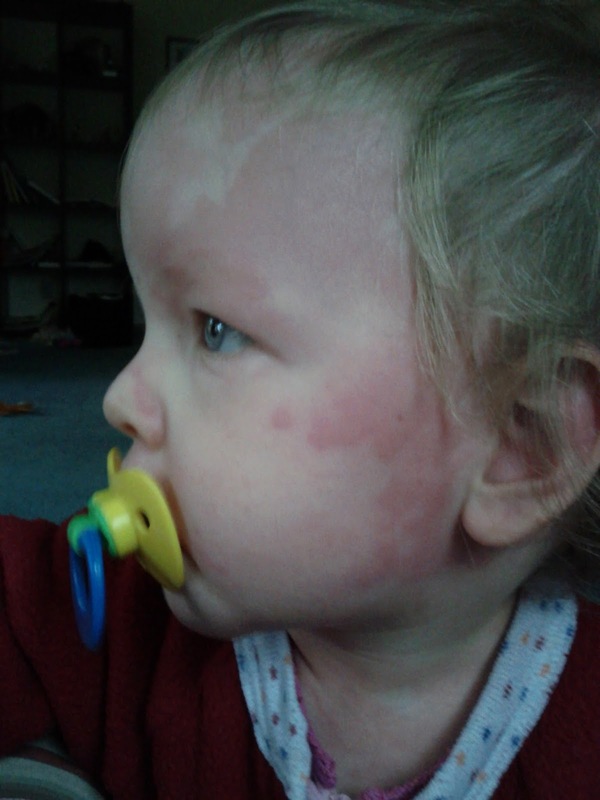 Serum sickness is an auto-immune reaction that can occur with any drug. 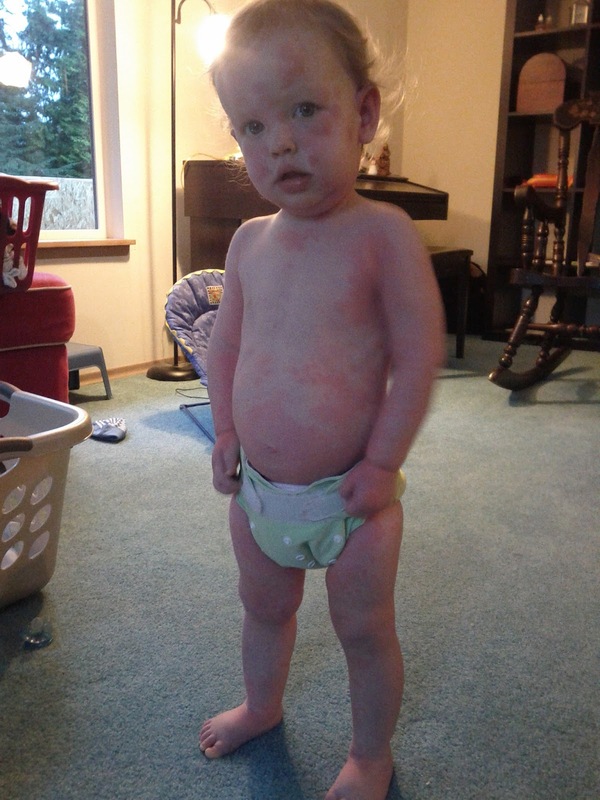 It shows up 7-10 days after being exposed to the drug, and usually is characterized by hives, fever, and joint pain. Swollen limbs is a less common effect. Dr. Belarmino explained to me that a serum sickness reaction is less predictable than an allergic reaction, so she may or may not get serum sickness from certain medications related to penicillin. Serum sickness is treated with antihistamines and, in severe cases, steroids. The urgent care doctor wanted some blood from Eloise to do some tests and see if she needed steroids. She didn't want to prescribe steroids unless she needed to, since steroids have a tendency to make babies crazy (right, Cheyenne?). Poor little Eloise. It's a good thing it was me with her instead of her daddy. He would never have let his baby girl get stabbed so cruelly. 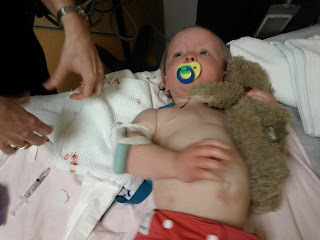 The nurses had a hard time finding a vein to get blood from in the princess's swollen arms and legs, so when they did find one, the left a tube in it in case she needed anything by IV before we went home. They put a tiny little splint on her elbow to keep Eloise from bending her arm too much. As soon as they put the splint on, she snapped it into two pieces. She's sick, but still super strong. The nurses had to give her a splint that went from her wrist to her shoulder. Then we waited for blood test results. We read "Panda Bear, Panda Bear, What Do You See?" 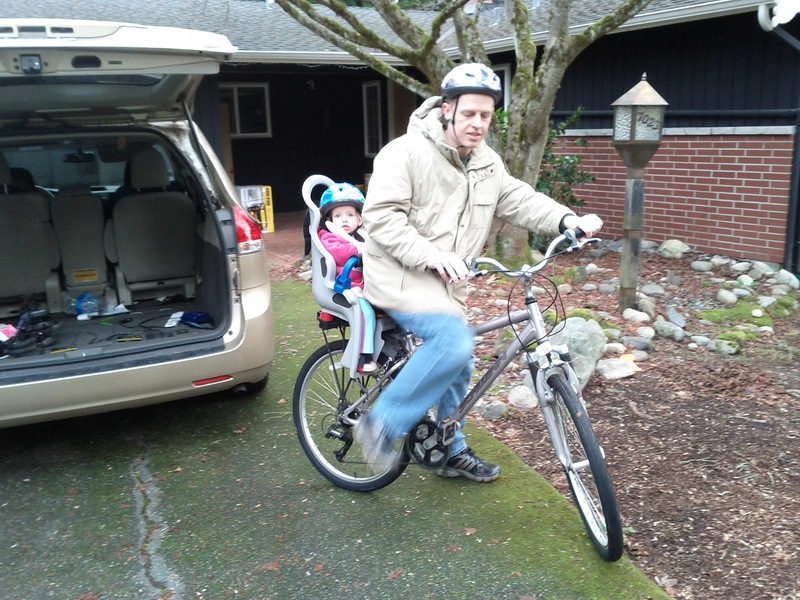 two dozen times, called Todd to let him know what was going on, and looked at pictures on the phone, as Eloise got more and more tired. She didn't complain very much about having her arm in a splint, except to occasionally point at it and say, "Stuck! Arm stuck!" She clutched her bear like a lifeline. Eventually the doctor determined that she didn't need steroids, so we could go home. We left for home at 11:30. 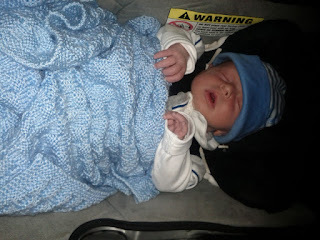 On Friday morning, we went to see Dr. Belarmino for a follow up. The swelling was a little bit worse, but it got slightly better throughout the day. This morning her feet were even small enough to put socks back on. 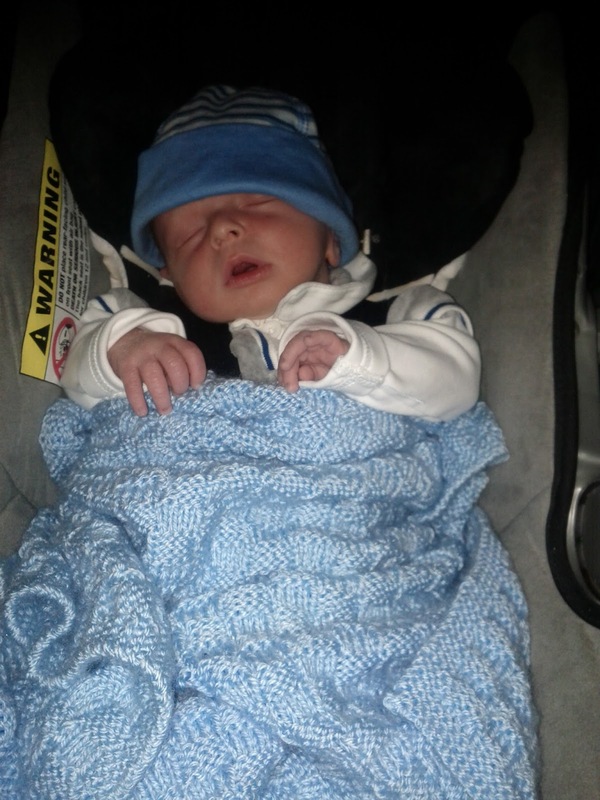 Yesterday afternoon I took Benjamin to meet his circumcision doctor. 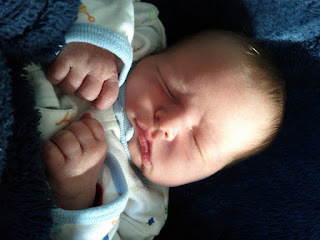 He diagnosed our tiny little guy with thrush and a yeast rash, and sent us home with another handful of prescriptions to get baby Benjamin healthy. I am exhausted. I have seen enough of the inside of doctors' offices this week to last me several years, but we are all finally on the road to recovery. All we need is a few uninterrupted hours of sleep. . .